This month in The Modern Marketplace we are proud to announce an exciting collaboration between the SHEILA BOWNAS archive and furniture brand PARLOUR. THE EDWIN SOFA is the product of Parlour’s collaboration with Chelsea of Sheila Bownas, a beautiful piece inspired by the versatile daybeds of the 1950s. Rich solid walnut pairs beautifully with a range of printed linens from the Bownas library which are mixed subtly with plain textured weaves. 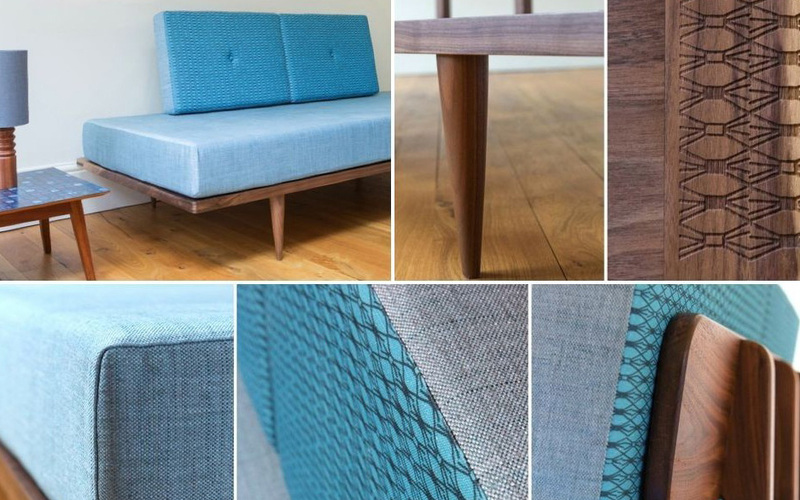 Designed to be both durable and comfortable, suitable for sitting or sleeping, each bespoke sofa is a celebration of design heritage and present day British craft. With a lead-time of four to six weeks, Edwin is made to order and available in steel blue, concrete grey or olive yellow. There is also a range of art prints, cushions, and fabric together with an exquisite set of table lamps made by renowned designer Zoe Darlington to complement the collection. Everything is made in the UK. You heard it hear first. We think Heals, Conran and Liberty will be fighting over Edwin. Parlour’s designer Garry Smith loves working with wood. He likes ash as it is not only beautiful but plentiful and sustainable. He also uses maple, oak and walnut, three popular woods that make beautiful end products.Smith studied cabinet making and wood machining at London Guildhall University, followed by a BA (Hons) Furniture Design and Fine Craftmanship at Buckingham and Chilterns University in High Wycombe, under the tuition of Hugh Scriven. Garry recently won the Leeds Emerging Artist Award 2010 for his creativity and unique designs and has achieved press coverage for his work in London, Yorkshire and the North East. Parlour is a family run business – a husband and wife team – with a workshop in the North East of England. SHEILA BOWNAS was a mid-century textile designer rediscovered by Chelsea Cefai after a chance find of many of her archived fabrics at an auction. In the course of discovering more about the designer Cefai found out how Bownas’ prolific talent was hidden from everyone, even her family, until after her death in 2007, when relatives took a look around and were amazed to discover hundreds of paintings and textile designs filed away in her small Dales studio. Sheila showed artistic promise from an early age, securing a junior art scholarship to attend Skipton Art School from 1941 to 1946, then a county scholarship to the Slade School of Art, where she won several prizes. She had five paintings accepted and exhibited at The Royal Academy of Arts and in 1949 her postgraduate studies took her to Florence where she read History of Art. She chose textiles and wallpapers as a more comfortable alternative to selling art. Living in London during the late 1950s and 1960s, she never married or had children but, we know from letters Sheila’s goddaughter showed Chelsea, that she worked on numerous commissions for Liberty of London, Crown Wallpapers, Marks and Spencer and the German firm PW Bruck-Messel. Sheila was also commissioned to work on pictures for the National History Museum where she spent some time on the Scilly Isles recording flora and fauna for them. Sheila’s early patterns are neatly abstract and thoroughly modern, mirroring the futuristic styles of Jacqueline Groag and Marian Mahler. The later designs of the 60s and 70s are both vivid and bold showing off her skill to form a clever pattern repeat similar to Barbara Brown and Shirley Craven. After she returned to Linton, Yorkshire in later life she never spoke to anyone about her career as a surface pattern designer but she continued to paint and draw the local people and landscapes. Chelsea Cefai recently visited the Slade School of Art where she was a student in the late 1940s for a private view of a painting by Sheila and some drawings which will become part of a major exhibition and retrospective of her work being curated for June 2015 where all 200 designs will go on display together with the letters and diaries. These distinctive pieces will be available online at www.sheilabownas.com from Monday 11th November. Sheila Bownas is just one of the many design studios you can find in our online shopping resource for the very best for the mid-century and modern lovers home. Link directly with designers and dealers. Unlike other online retail directories and stores we do not make a percentage on sales. All you have to do is sign our mailing list to get instant access to 150 plus dealers, designers, vacation and party ideas that will appeal to all midmod lovers. c Lucy Ryder Richardson at Modernshows.com . Please contact lucy@modernshows.com if you would like to reproduce this feature or any part of it. Check out the film about our company too.